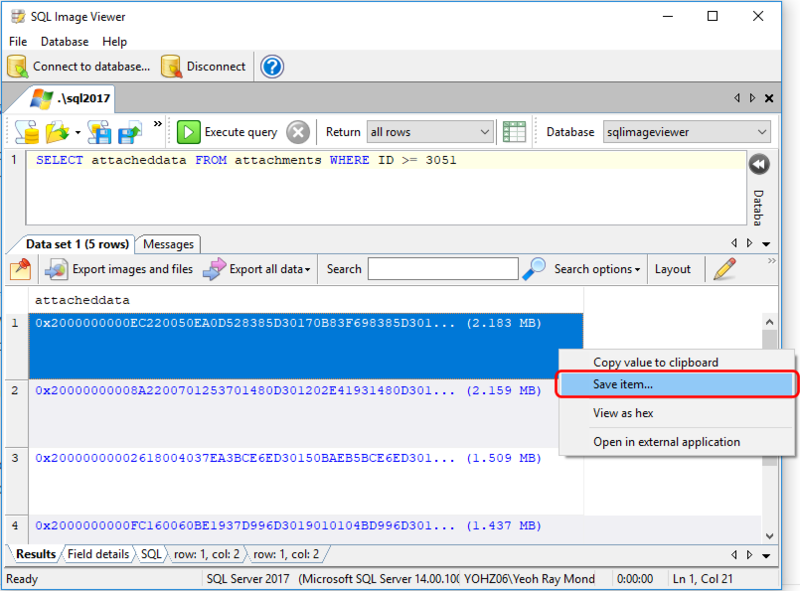 If you are using a third-party application to upload images and/or files into your database, and SQL Image Viewer cannot identify the image or file type, then there’s a high probability that your application has modified the data. we can see that the OLE wrapper (or the original source data) begins at offset 32. 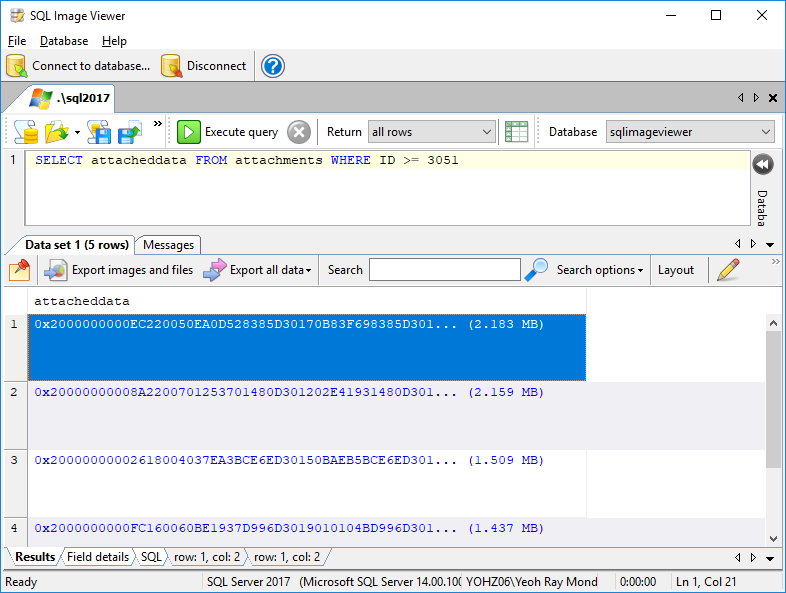 This means that Financial Edge has added 32 bytes of data to the beginning of the original file, which is why SQL Image Viewer does not recognize the file format. 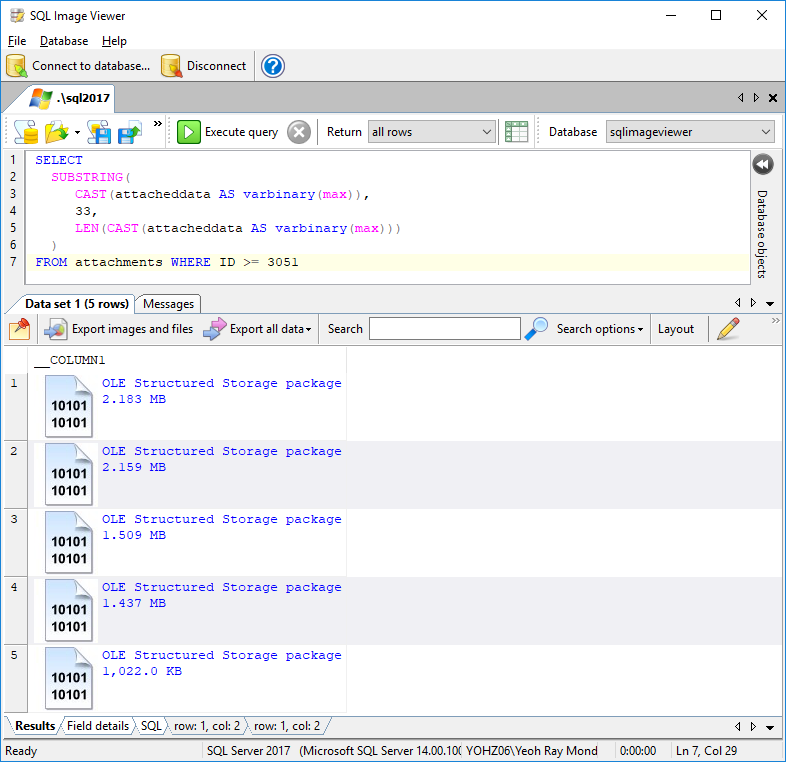 Now, SQL Image Viewer is able to identify the file type correctly. 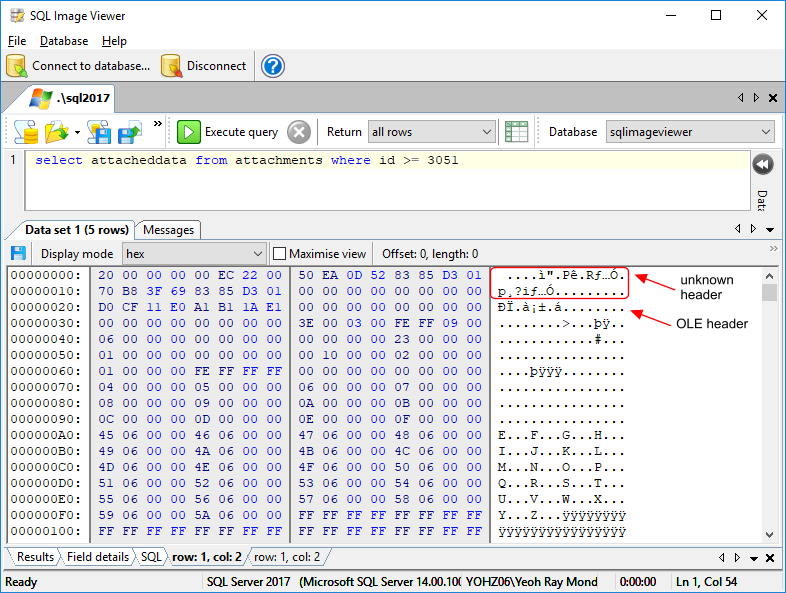 Ok, admittedly not everybody knows what an OLE wrapper looks like, or any of the other file headers, which is why if SQL Image Viewer cannot identify your blobs, please send us a couple of samples to analyze. We need the data exactly as stored in your database, so to extract the data, please perform the following steps and send us the resulting files. Select the column containing the unidentified blob data. Right click the mouse button to bring up the context menu, and select the ‘Save item’ option. Enter a file name, save the blob data, and send the file to us at support@yohz.com. 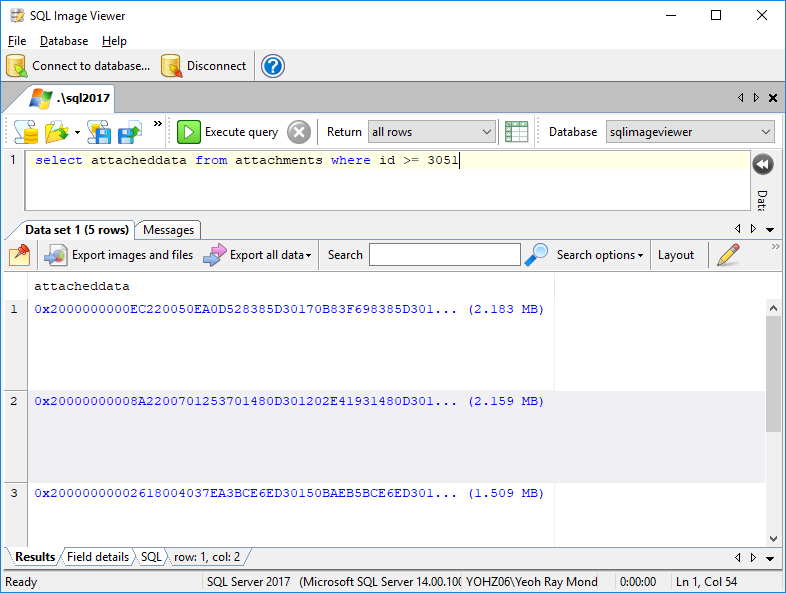 The same issue applies to Access OLE Export and SQL Blob Export too. 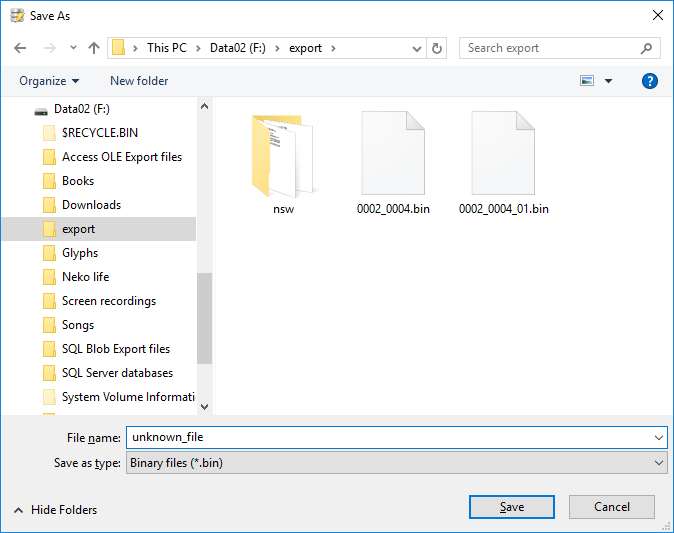 If these products cannot identify the file type because the original files have an additional header, they will be exported with a .bin extension. Please send us a couple of those .bin files to analyze, or you can also use SQL Image Viewer to retrieve the data and follow the steps above to send us the samples. This entry was posted in Access OLE Export, SQL Blob Export, SQL Blob Viewer, SQL Image Viewer and tagged Access OLE Export, Blackbaud, Financial Edge, MAZE School Information System, SQL Blob Export, SQL Image Viewer on November 5, 2018 by bloggyadmin.